"Here Comes the Boom" Trailer Looks to Be a Comic Sequel to "Warrior"
Are you ready for Kevin James as an MMA fighter? "Warrior," starring Tom Hardy and Joel Edgerton as estranged brothers on a collision course in an MMA tournament, was one of the great overlooked gems of 2011. Though its box office take was meager, it was affecting enough to have spawned Kevin James next film. "Here Comes the Boom" stars James as a teacher at a high school facing massive budget cuts. So James vows to raise the money necessary to save the music program, and eventually decides that pro MMA fighting is his best way to do that. In "Warrior," Edgerton's character is a high school teacher with an upside-down mortgage who returns to his MMA roots, fighting in bouts staged in parking lots to make $500 a night. One can easily imagine James and Adam Sandler watching the film at home and thinking, "Wouldn't it be funny if he was a fat guy?" And because this is a Kevin James joint, you know his love interest is woman who would be wayyyyyyy out of his league. This film's lucky winner is Salma Hayek, who follows in the footsteps of Amber Valetta, Maria Bello, Winona Ryder, Rosario Dawson and Leslie Bibb. 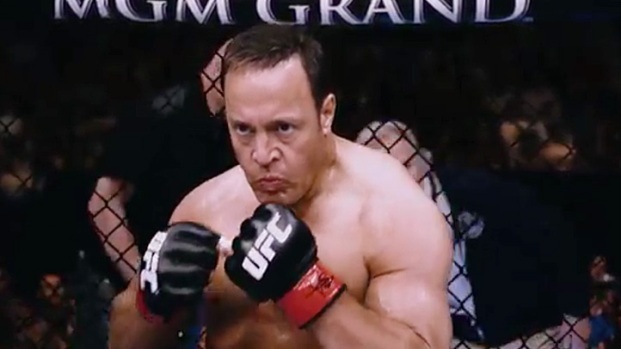 Kevin James stars as a teacher at a high school facing cuts to all its extracurricular activities, who takes it upon himself to raise money by taking up MMA fighting. Opens Oct. 12. The tone of the "Boom" trailer is weirdly serio-comic, giving the sense that it's striving for some sort of uplifting message. We'll know for sure when the film opens Oct. 12. If nothing else, maybe "Boom" will nudge a few more folks toward "Warrior."